Inter Community Services | If you need us we're here - if you don't need us, then we need YOU! The Mobile Food Truck will be held the 4th Saturday of every month in the cafeteria at Stevenson School in Ransomville from 11:00 to 1:00. This is open to all members of the community. To provide, without profit to the Corporation, services to meet the needs of individuals and families in the communities of Western New York, including: providing nutritional cooking classes; encouraging reading through the distribution of books to children; providing access t quality clothing through the distribution of new and used clothing to community members; operation community gardens; offering guidance and mentoring concerning daily financial management, parenting, marriage and other life issues; and operating a food pantry. The Care-n-Share Food Pantry was started in December of 2010. That year we assisted 21 families, the need has increased where we now serve on average of 320 individuals a month. We are totally reliant on volunteers and donations. 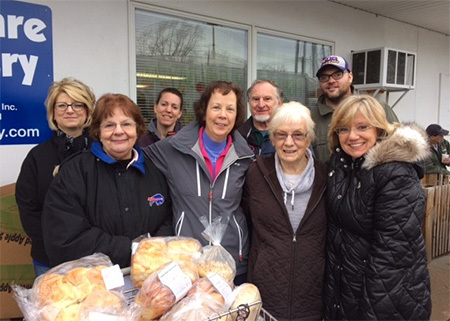 The volunteer Board of Directors of Care-n-Share and Associate Board worked toward getting the pantry a 501 (3) (6) status in 2015. Intercommunity Services is the parent organization of Care-n-Share Food Pantry and holds the 501 (c) (3) certification.